The CalGasWarehouse vision arose out of operating our safety supply store. 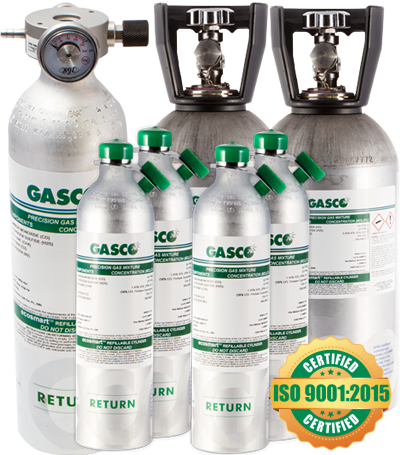 We are calibration gas customers, just like you. We ran into the same troubling scenarios that you all do when looking for quick, reliable and competitive service. It was taking us weeks (sometimes longer) to get our calibration and bump gases. We used several vendors and they all seemed to be the same. They either didn’t want to sell us the gas, or if they did, it was outrageously priced. In order to service our customers with the top-notch service they expect, we needed to make a change. With some research, phone calls and good old-fashioned networking, we were introduced to Gasco Afilliates. Their reputation for precision gases is world renowned. They don’t sacrifice quality for speed, yet they are one of the fastest in the industry. Gasco doesn’t sell to end users, which allows vendors like us, to keep our relationships with our customers. We saw a need for an industrial gas focused business. All of the calibration and bump gas vendors we were using, treated the gas a an “also” category. They had gas detection units, welding supplies hardware supplies, and safety, but gas was not their primary focus. We met with Gasco and our vision was the same. Gasco had a vendor they could rely on to sell just gas and accessories and CalGasWarehouse had a reliable vendor that is second to none in speed, quality, price and service. One of our primary goals was to make CalGasWarehouse.com easy to use and be an e-commerce site that matched the speed, quality and service of Gasco. We believe we have achieved that here. This is industrial gas ordering made so easy, its elementary. You don’t have to wade through thousands of products to find your gas. You don’t even have to memorize your part number. You can, however, cross reference it. You can also simply enter the size, the gases listed on the bottle and you are off to the races! CalGasWarehouse also offers a “repeat last order” function for those whose orders never vary. Our team has over 5 decades of experience in construction, safety, sales and service. We will be dedicating a team from our safety store whose sole endeavor will be operating CalGasWarehouse and those businesses will be run completely separate from one another. We are excited to partner with Gasco and we are excited to bring you one of the few industrial gas focused businesses around. We think you will find that our ease of use, speed of service, quality and competitive pricing will parallel what Gasco has been doing in the industry for years and will be unrivaled in other offerings available today. If you are an existing customer, thank you and welcome home! If you are new to CalGasWarehouse, we look forward to establishing a relationship you can rely on! If you read this far, your gas could have already been on the way, now go buy your gas!